30w to 100w RGB LEDs require at least 32v. So most common power supply is 36v. 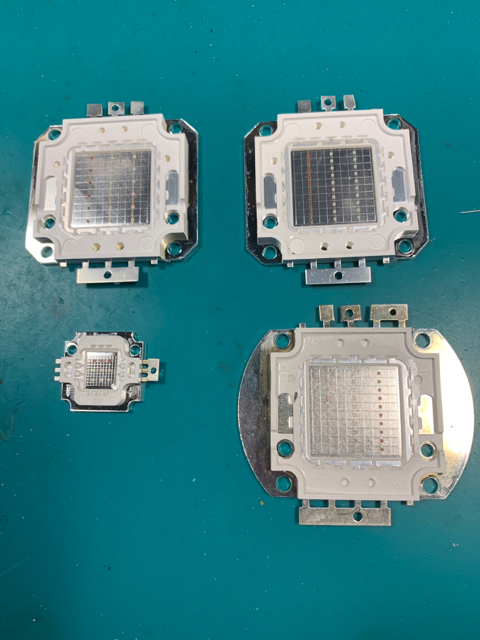 Some 20w are also 32W, depends on the led layout. So how does this layout compare to yours? A collection of a 10w, 20w and 30w LEDs. Yours looks good. Still trying to figure out what that extra chip is on the far right. Voltage regulator or signal amplification? I did not jump to the AL8862 yet. My board is using the AL8861 still so it is not quite as cluttered. It has a resemblance to your SMD 10w with my own organization of the components and routing. I’m going to attempt this version next for the 50w and 100w floods I want to build. Its broken down into 3 areas, you know the control circuity, below it is the WS2811 and line driver group. To the right of the control circuitry is the buck converter group for supplying 5v to the WS2811 and sidecar. The buck converter is needed since a linear would burn out at the higher voltages. I actually have the 8860, 8861, and 8862 which all work with this configuration. Only difference is high end voltage on the 62, I haven't completely figured out the differences between the 60 an 61. I built a driver by using a different one on each channel to see how it would work and had no issues since I got them all in the same configuration. It looks like you have an extra MLCC in the control circuitry that I do not have on mine. To the right of each of the 62's and current sense resistors. What is that for? Ya I would try the 62 on mine, but I designed it with the TSOT25 package instead of the MSOP-EP8. It's an input decoupling cap, C1 in the spec sheet. Just helps with noise from all the switchers smoothing the ripple on the input and supplying peak current to the coil. You can have the eagle files for mine if you would like to start with it for your bigger floodlight plans. I did find a problem in my design, which I could work around in the buck circuitry. I did a pull down instead of a pull up on the enable pin, simply had to put in a wire to get it all working. Hard to get 5v out when the chip is disabled. I'm also swapping out the diode on the switcher for the same one used in the control circuitry. Will be sending off for new boards this week. DHL this time :D Working with 2 vendors to see what it would cost to have them fully assembled, if there is interest in a group buy. I know a lot of people are scared of the SMD chips, I've actually gotten to the point where I believe it's easier as long as you go no smaller than 805. Once I have the working boards, the gerber and design files will be made available to anyone that may be interested in them. Oh. I just used the main 100uF capacitor as C1. Now that I actually read the spec sheets, I see that might not have been the best. Its working great though without one per IC. Awesome. Thanks for sharing your designs! What is the size of the board?